A modern home in North Davis has gained renown as a peaceful, meditative – yet somehow rollicking – place, thanks to good press, regular TV coverage, and the personality of its owner, who opens its garden to the public to benefit good causes. 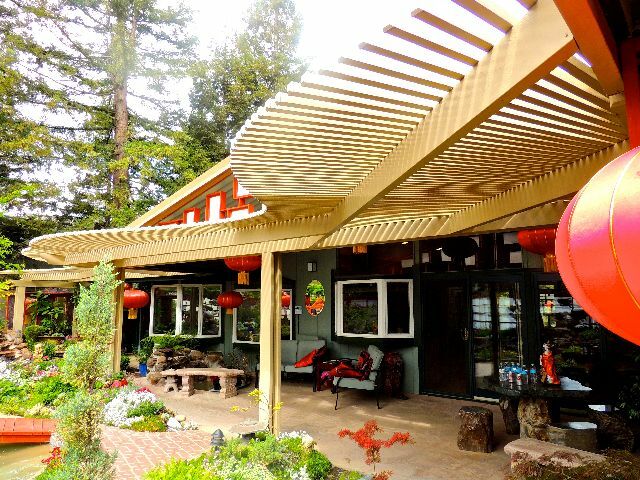 Huei’s Garden, on Luz Place, in a North Davis neighborhood that blends modern homes built in the 1970s by the Streng Brothers with more traditional homes, is open for several tours this spring and early summer. “I did everything here in Davis to make my dream come true,” says Huei Young (her first named is pronounced Way), who owns the home with her husband Frank. Huei, who does all the gardening herself, has turned her back, side, and front yards into Asian paradises. More than that, she has expanded her garden – with city permission and cooperation – onto a portion of the public greenbelt that passes her house. Peaceful and Zen-like the garden may be, but sparse it is not. Every inch is filled with something – flowering shrubs, Japanese maples, tiny pagodas, statues of Buddha, sculptures of frogs and turtles. A careless visitor could slip from a bridge into a pool. 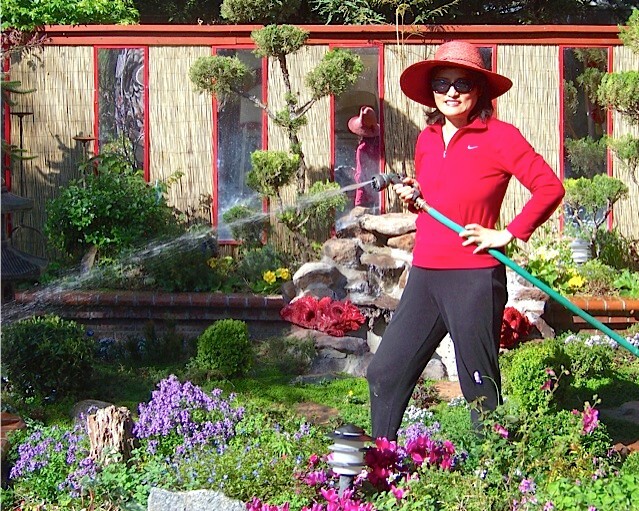 Huei says her garden has healthful properties. It has helped her husband, Frank Young, who suffered a serious injury in a fall in 1997. Despite the disabling injury, he remained active in community affairs, working with Huei to feed poor people at Davis Community Meals. 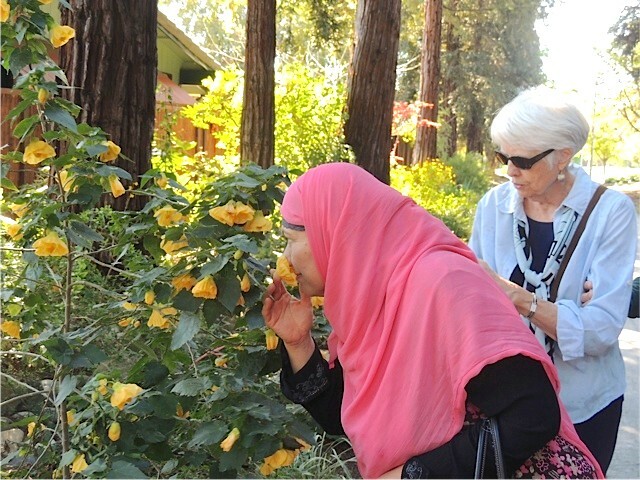 Friends – and Huei has many, whom she calls “my family,” or “angels” – have helped her on her garden. Don Rudisill, a friend for some 40 years, helped Huei put in her waterfall 20 years ago and has constructed the box-like screen that decorates the gable end of her backyard roof. He gathered at her home recently, along with other friends, for a lunch Huei prepared. 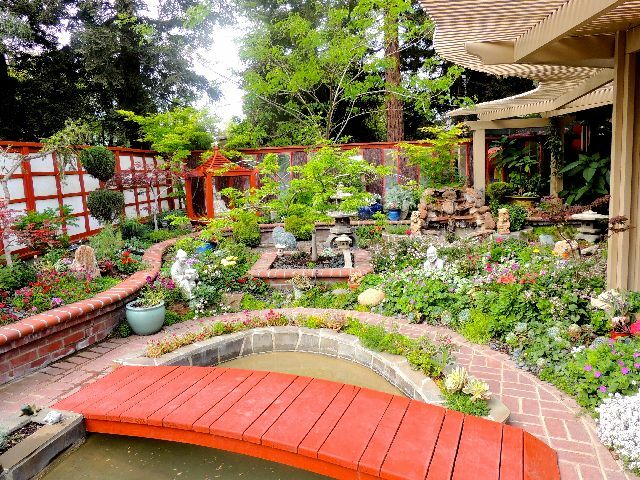 Another guest was Cody Stark, the popular television newscaster, whose show, ‘Good Day Sacramento,’ has done much to draw attention to Huei’s garden. Stark says he and Huei became “instant friends” on their first meeting, when he was interviewing her for the show. The lines and structure of the Streng home can be read from the street. But the rest is all Huei. Photo by Dave Weinstein.